In the belly of a hollowed-out volcano, maniacally laughing and rubbing their hands together in a way only villains are wont to do, WB/DC executives had to be overjoyed when writer/director Edgar Wright left Ant-Man just as production was starting. Finally! A Marvel Studios misstep! “Soon,” they must have thought, “very soon, the world will forget Green Lantern and Catwoman! They’ll replace Batman and Robin on their ‘what were they thinking’ list with Ant-Man! I mean, they actually replaced a critically acclaimed artist with the guy who did Bring It On! This simply can’t be good! Mwahahaha!” Actually, it can, and it is. Those were preemptive mwahahahas; sorry, volcano dwellers. Ant-Man does have a clunky as hell first act. It’s where all the warts of changing pilots appear. Director Peyton Reed doesn’t let charismatic reverse-ager Paul Rudd fly his freak flag at first, reducing him to a kind of boring dude. Rudd is Scott Lang, a talented electrical engineer who spent the last few years in prison for burglarizing a corrupt CEO in a total Robin Hood riff. Once he leaves the clink, he reunites with former cellmate Luis (Michael Peña) who convinces him to do “one more job,” stealing from another CEO. Lang doesn’t want to, but he loves his daughter and his ex (Judy Greer) says he can’t see her until he pays up on child support. When Lang and gang bust into their targeted safe, they find only a weird suit. Lang tries it on because that’s what you do when you find a weird suit and mask. He discovers the ability to shrink into ant-size, while retaining vast strength. Turns out the theft was all a ruse set up by the suit’s owner and original Ant-Man, Hank Pym (Michael Douglas), who wants Lang to use it to break into his old company and prevent the new CEO, Darren Cross (Corey Stoll), from weaponizing shrinking technology. With the help of Pym’s daughter, Hope (Evangeline Lilly), Lang must train for and pull off a daring heist in no time flat. What works best in Ant-Man is the cast. Douglas, Rudd and Lilly have ridiculous amounts of chemistry, with Douglas’s “get off my lawn” attitude pleasantly playing off Rudd’s goofy schtick and Lilly’s earnest seriousness. But in a movie about thieves, it’s Peña who steals every scene. His perma-smiling, fast-talking ex-con is just gut-bustingly funny. And as many have been quick to note, the lower stakes here feel fresh. As comic book movies have scrambled to get bigger and bigger, Ant-Man delightfully and appropriately shrinks the scope. Beyond the dull first act, the film also misses Wright in the big visual numbers. It’s not that Reed botches them. He doesn’t. In fact, all of the set pieces are pretty great. They’re just mostly straightforward. Thinking of what Wright could do visually with a scene set in a kaleidoscopic “quantum reality” between molecules fills one with giant-sized regret. 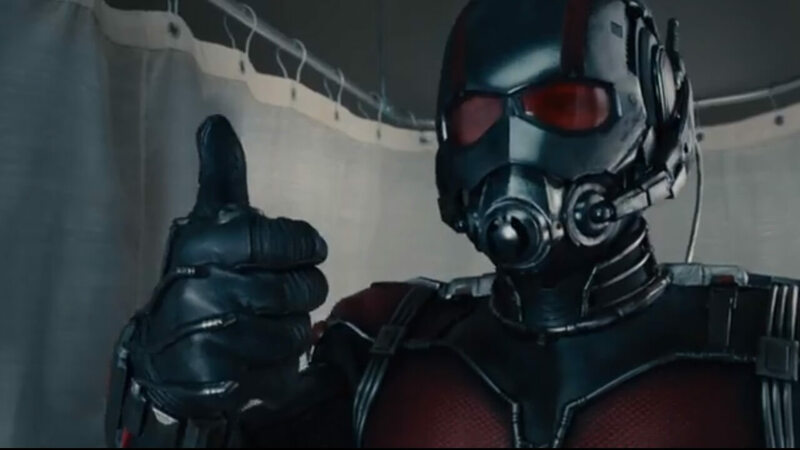 Still, Ant-Man is great; an optimistic jaunt with plenty of cleverness and oodles of joy. Yet another feather in Marvel Studio’s increasingly peacocked cap.